Mixed Reality applications present a growing opportunity to increase efficiency and cut costs across a range of enterprise settings from design and manufacturing to training, maintenance and retail. This article focuses on Mixed Reality use across industrial and manufacturing settings and gives some useful tips on how to get started on a Mixed Reality training project. Mixed Reality as a broad concept refers to a continuum of experiences anywhere between the extremes of the real, physical world, and a fully virtual experience. In a more limited sense, Mixed Reality (MR) refers to visualisations and environments where physical and digital objects co-exist and interact in real time, allowing users to experience digital elements as if they were a part of the real world. In enterprise settings, MR typically refers to this more limited concept of Mixed Reality. In a Mixed Reality experience, digital elements appear three-dimensional to the user, and respond to user cues via gaze, voice, hand gestures or motion controllers. The digital elements can be fixed to a point in physical space, retaining their position, shape and scale even if the user moves around. This interactivity facilitates the creation of life-like simulations combining digital and physical objects, locations and people. How does MR work in practice? A user of a Mixed Reality application typically wears a see-through headset, which allows the viewing of and interaction with the digital elements overlaid with the physical space. 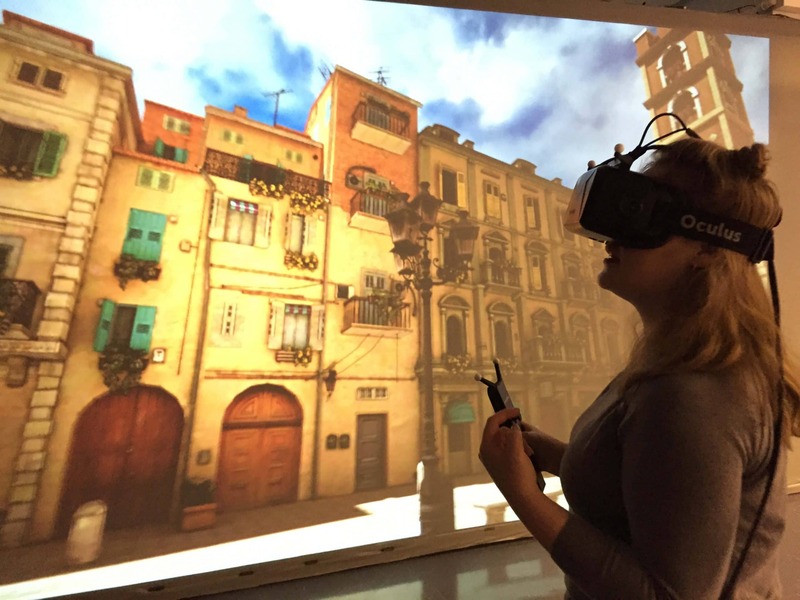 As opposed to the closed-off virtual reality, the user is completely aware of the actual surroundings while interacting with the digital content. Another important advantage of MR devices is that they allow workers to perform tasks hands free with on-the-spot digital information displayed in their field of vision. Whilst the Microsoft HoloLens is the leading MR ready headset, several alternative solutions exist. MR ready hardware includes helmets and hardhats that adhere to safety requirements at building sites and other hazardous environments. Replace lengthy paper manuals with real-time, interactive instruction received via a headset, combining digital graphics and remote support via video and audio to the on-site engineers and front-line staff. Save time and cost by using digital components over physical prototypes to test ideas, design and functionality. Speed up the training of new staff significantly, facilitating remote support by experts or sharing the knowledge of retiring workers. MR also facilitates effective on-the-job training and safe training for hazardous situations. Case study: Stereoscape collaborates with energy company Fortum at a nuclear plant to trial an MR application which detects hazards imperceptible to human senses. The ‘Industry 4.0’ transformation is underpinned by the adoption of digital technologies that help automate processes, optimise efficiency and reduce costs. Virtualisation is an integral part of the transformation, and industry leaders across sectors are adopting MR and other XR technologies to increase productivity, quality and safety. Which industries can benefit from adopting MR? With industries including aerospace, architecture, construction, design, energy, manufacturing, mining and retail already trialling and adopting MR applications, it is clear the field holds much promise. The automotive industry in particular has been an early adopter of MR in their processes. The below examples highlight different ways in which MR can be applied to increase efficiencies and stay competitive. A chance to integrate digital guidance in the real world makes MR especially useful in on-the-job training. Context-relevant digital information helps workers perform tasks, even if they have little formal training. And a remote expert can provide further assistance in the trainee’s field of vision. Working and learning simultaneously enables more rapid skill acquisition, and MR can even lower the skill requirements for new hires. MR is also well suited for advance practice of tasks. Mixing together digital content and real-world views provides a visual, inspiring and interactive way to teach complex topics. Training is more engaging and memorable. Multi-user MR enables training sessions where a “master” – like a retiring employee – guides “apprentices” through digital training content and participants can explore the content from various vantage points. How to get started on MR training? 1. Visit industry events or tech vendors’ and solution providers’ showrooms to personally test drive MR technologies and solutions. Seeing is believing, and it’s important to experience MR in action to understand its potential. 2. Think about MR as an enhancement to – rather than a replacement for – your existing training solutions, as you have invested a lot of money and intellectual capital in them. It can also make financial sense to replace a traditional training module with an MR alternative. You may be able to save on travel and material costs or significantly speed up the learning process. 3. Consult end users and other stakeholders to choose a use case. Do your employees feel they have learned certain tasks on the job through trial and error rather than in a separate training session? Do your workers need to train for dangerous situations that are expensive to replicate in the real world? Would the learning services you sell to your customers benefit from MR as a competitive differentiator? 4. Start from a pilot to demonstrate technological feasibility, business viability and usability and desirability from the trainees’ point of view. Identify key performance indicators you will track to measure pilot results. 5. If you are thinking of partnering rather than developing the solution internally, there is already an ecosystem of potential partners available. Choose a good partner who understands your needs and get started. My next blog post discusses virtual reality in recruiting and on-boarding. Augmented Reality provides a nimble and cost-effective way to engage corporate learners, particularly the Millennial workforce that has grown up using their mobile devices for gaming and communication. This article continues our blog series about how to benefit from various extended reality tools and techniques in the corporate training context. Augmented Reality (AR) refers to the overlaying of on-screen digital objects such as images, text or video, with real-world, physical elements. The applications of AR are already versatile, and the list of use cases is rapidly growing: Christie’s invites clients to explore its fine art auctions in AR; Gatwick helps passengers navigate the airport with an AR wayfinding app; and Caterpillar uses AR to guide service technicians through complex procedures. From gaming to shopping, the number of AR users grew from an estimated 60m in 2013 to 200m in 2018, and the value of the AR market is estimated to reach US$120 billion by 2020. The popularity of AR among consumers drives the growth in the use of AR in corporate training. Automotive supplier Bosch is currently launching AR applications to make complex technology more transparent in the training of workshop personnel. Learners pointing their tablet computers (or smart glasses) onto a vehicle component receive explanations, 3D objects or videos overlaid on the physical component. In a multi-user scenario, the trainer can control the participants’ tablet devices to supervise the learning experience and customise the contents to each specific training group. Embracing AR for training is not limited to a specific sector or industry. Whilst its use is growing particularly fast in the Education and Healthcare contexts, industries from Hospitality & Tourism to Oil & Gas, and organisations as varied as Boeing, DHL, Honeywell, Cisco and the US Marine Corps have already employed AR in their training programmes. The strength of AR lies in its ability to provide a mixed-life experience, adding digital elements to the physical environment of the learner, allowing users to learn and practise skills safely in a realistic environment. AR can increase engagement and skills retention in diverse learning situations, from new employee onboarding to receiving real-time support for challenging or rarely performed tasks. AR is also ideal as a didactic support for mobile eLearning applications. AR should not be confused with VR, which refers to an entirely digital and fully immersive environment, experienced in a way that shuts out the real world. Both approaches have their uses in the digital training toolkit, depending on the specific learning goals. Our next article provide tips on how to get started on a Mixed Reality training project. Helping products tell their stories is a growing field we are working on at Stereoscape. The increasing volume of IoT data generated by the things around us needs to be communicated to drive better understanding, learning and decision-making. To broaden our thinking on how to translate and present IoT data for explanatory, analytical and inspirational purposes, we also look for new insights at the intersection of art and technology. Our project with artist Josefina Nelimarkka on her latest exhibition, Kairos καιρός at HAM Helsinki Art Museum, is an exciting collaboration on communicating atmospheric phenomena. A graduate from the Royal College of Art in London and the Academy of Fine Arts in Helsinki, Nelimarkka works in both cities. She merges arts and sciences in her multidisciplinary works that often focus on rendering visible the inaccessible and invisible worlds that are impossible to grasp directly. Kairos (‘time’ and ‘a supreme moment’ in Ancient Greek and ‘weather’ in Modern Greek) is inspired by the research on atmospheric aerosol particles and climate change at INAR Institute for Atmospheric and Earth System Research at the University of Helsinki. Stereoscape had the pleasure of working with the artist on screen-based installations, including augmented reality that overlays digital content on top of the real world. Air quality data from a real-time emission monitoring system installed on the roof of the museum in downtown Helsinki is translated into interactive visual experiences. These ‘airscapes’ are constantly changing in form, colour and sound with the actual air quality. Enabling products, objects or spaces to communicate with people through interactive visualisation of real-time sensor data is an integral part of smart product communication. This inspiring art project has provided us with fresh impulses on how to render the invisible visible through creative visualisation and how to help users interact with IoT data to explore and make sense of it. “We are transforming product communication with our smart product communication solutions” is one of our opening lines when presenting Stereoscape as a company. But what do we mean with smart product communication and why is it so smart? Internet of Things (IoT) and augmented reality (AR) are match made in heaven. Saving money, making work more efficient, safe, fast, accurate… the benefits are numerous and clear. There are, however, some questions that often preoccupy the minds of people when talking about IoT and AR applications. To get the right technical answers to the questions that I hear the most from our clients I asked our Development Director Matti Gröhn and our CTO Ferhat Sen for explanations in plain English. Q: IoT and AR are a match made in heaven. But what are the prerequisites, for example, what is the right data format for IOT data used in AR applications? A: The right data format is standard and well documented. Any standard data format that provides the necessary information for the application in question is good. One commonly used, for example, is JSON. Also, what comes to documentation the AR applications are no exceptions to any other applications; the data structures and content need to be well described. AR as such doesn’t bring any extra claims for the data format. Q: IoT means real-time data. But how real are we actually talking about in AR applications? A: This is completely context dependent. That is, how frequent updates are needed depends fully on what is being measured. For example, for measuring changes in room temperature you don’t need to update the data every millisecond; once a minute is already good enough. Q: How can you document the events in AR applications? I.e. how can it be seen afterward what route did the person take, which sensors and what data did he see etc.? A: Short answer: record every necessary event into a log file. For getting an estimate for what route the person actually took and what he saw, or was supposed to see, you need to use indoor tracking. Indoor tracking has taken big steps and is now mature enough for commercial use, even AR applications. If you also need to know afterward what the person was actually seeing – or where did he look – you can record the device camera view and use gaze-tracking to get the exact knowledge. Everything can be saved in the log files for very accurate documentation, but how much and what is necessary to save on the log files depends, once again, on the case. Q: There are plenty of AR devices on the market already; from tablets and smartphones to smart helmets and smart glasses; what are the pros and cons of the existing devices and where is the development leading to? A: Pokémon Go took the world by storm a few years ago. Since then the amount of different AR applications for mobile devices has been increasing rapidly. However, for industrial IoT AR applications, it is often essential to keep heads-up and hands-free. Which in turn means that you need to use head-mounted devices instead of tablets and smartphones. With head-mounted devices the problem is often to find the right balance with the field of view – i.e. the size of the area where data can be displayed – and how much the display itself obscures the person’s view. Naturally, small smart glasses have a smaller area to display the data than larger helmets or devices with visors, but in turn, they block less of the real-life view. For user comfort it is also important to have devices that are not too heavy. We have used and tested, for example, Microsoft HoloLens, Daqri smart helmet and glasses, and RealWear HMT-1 for some time already and have seen how rapid the development is. It has already advanced to the point when it’s feasible to pilot the devices in different tasks and parts of processes. A full-scale release of applications, that make the IOT and AR match made in heaven come true, will be a lot easier when testing and finding the benefits are done well and in advance. Anything else about IoT and AR that puzzles you? Please give me a call or come to meet us at Arrow IoT Summit in May to see how we can be of help to you. To make the impossible possible. That is one of my favourite phrases when talking about augmented, virtual or mixed reality. Many of our customer cases serve as great evidence of this. Taking you underwater to see how a propulsion system of a ship works, making you ”see” the invisible, or making it possible for you to pack a whole house with all its design furniture and objects into a simple box to travel around the world with. By doing this, our smart product communication solutions help people understand more about products to make more confident purchase decisions or to work smarter, learn faster and collaborate more effectively. At exhibitions and trade fairs, the queues to experience the digital realities – still novelties in many ways – are often long and create a good buzz at your stand. Visitors donning AR, VR or MR headsets are instantly amazed: The depth of the experience is unrivalled; creating powerful engagement, impact and emotions. But the number of headsets available limits the number of visitors you can engage. When you need to reach wider audiences – the thousands of passers-by – 3D holographic displays are an alternative worth considering. Such displays, like Dreamoc XL3 or the new DeepFrame from our partner Realfiction, can provide realistic 3D visualisations with unique perspectives and a captivating sense of depth. Content that appears to be floating in mid-air is an eye-catcher and visible to the naked eye by anyone within a viewing distance. Many of the displays also allow you to place physical items inside the display, enabling a mix of real and digital. We recently created a series of 3D animations for large holographic displays to showcase a client’s products in large trade fairs. In real life, the products are used thousands of meters under the earth’s surface. With 3D holographic displays the products and their unique features and benefits could be shown in a very effective way: visually outstanding, highly informative and inherently interesting. And most importantly, they could be shown to large groups of people at the same time. In a world where “VR can take you anywhere and AR can bring anything to you” just showing your content in a display might seem like a step backwards. In my opinion, it is rather a “sidestep with bonuses”. Firstly, it is possible to add touch or gesture control to involve your audience in interaction: Viewers change the content; see your products from different angels etc. Secondly, it is another medium for people to interface with 3D content – along with AR, MR and VR – putting your digital assets in efficient use. Once created, the same photorealistic 3D model of your product can be utilised for different purposes – not only in marketing and sales, but also for other product communication needs across the product lifecycle. In the realm of marketing, you need some clever creative storytelling on top of the 3D model to catch the audience attention and let them learn about your product in a condensed format, while conveying a lot of complex information in an easy-to-understand manner – a common dilemma in the communication of industrial products and services, which is what we specialise in. When you need to engage large numbers of viewers in a short time, a holographic display could be the right solution for you. But it definitively doesn’t mean that you have to exclude the new digital reality tools from events and exhibitions. On the contrary. Once you have caught the attention of the masses with your holographic display, one short conversation is enough to scan the ones with true interest and business potential. And what would be a better way to deepen their interest than an in-depth experience – be it VR, AR or MR – that allows them truly immerse in your product or service? Interested in hearing more about how to use 3D holographic displays to present your products to the masses? Give us a call! Augmented Reality World Expo AWE Europe was held in Munich in October. Steresocape’s team visited the expo where all the latest solutions, applications, software, hardware, cases, and pilots were showcased under one roof. The two digit numbers for productivity improvement, cost or time savings that industry giants like Bosch, Coca-Cola, GE Aviation, Lockheed Martin and Siemens were presenting were simply impressive. Lockheed Martin’s assembly workers accuracy rate improved to a full 100% with AR. GE Aviation reported 8-12% increase in mechanics’ efficiency for critical engine maintenance tasks. Siemens Power and Gas used AR to train new workers in 45 minutes when it used to take a whole day with traditional training methods. 90% error correction, 30% reduction in assembly time in manufacturing and warehousing, 30-50% reduction in inspections, 50% travel reduction for field engineers in insurance and construction, 20-50% reduction in training…. Just stop and think what this brings to the bottom line – when sometimes even a 1% improvement in maintenance efficiency can bring cost savings worth over 200 million euros annually, like it does in aviation industry! Who wants to look like Robocop every day at work? Hardly anyone, at least I don’t! The acceptance problem has been a reality with industry AR and VR. That’s why it was very pleasing to see in Munich the wealth of new hardware and devices for both AR and VR that were smaller, lighter and easier to use. VRGineers’ VRHero 5 headset comes with high-quality 5K resolution displays and 170 degree field of view. The new smart glasses from Epson only weigh 69g, not much more than a pair of normal eyeglasses. Our partner Daqri was also presenting its new smart glasses with remote expert function. Of course, the acceptance problem can’t be solved with just devices, no matter how light or convenient they are. But with devices that are comfortable to wear and have well designed interfaces and functionalities that really add value to the worker himself as well as to company we’ll see great benefits coming from AR and VR. It was interesting to see not only the American companies but also some European leaders like Audi, BMW, Bosch, and Siemens presenting projects with very impressive results. Bosch presented 15% time saving in its car service workshops using AR solutions. GE Aviation gained substantial improvements in how mechanics performed critical engine maintenance by using AR; errors reduced, efficiency and product quality improved, worker compliance increased and job satisfaction was higher. The savings are counted in millions of dollars. Siemens created an AR tool to make wind turbine hub inspections more efficient and more effective. The inspections were done 40% faster with AR. In terms of technology the presentations contained no big news for us. However, what was prominent was the fact that most of the industry cases presented in Munich were still pilots. An indication that the global leaders are working hard to be ready to reap the profit when the time is right. Also indicating that the time to do the pilots is now. Some big companies like Bosch with its Common Augmented Reality Platform (CAP) and Boeing with its Boeing Augmented Reality Kit (BARK) are already taking the next steps. They are piloting customized industrial AR solutions in their own research labs and trying to standardize them in their own processes and in their stakeholders’ processes. Have you started your pilots yet? If not you’d better hurry up! Read more news and thoughts from AWE Europe from Jani’s LinkedIn post. Tech Open Air (TOA) Berlin is Europe’s leading interdisciplinary technology festival. The event, held already for the 6th time in July filled the legendary Funkhaus Berlin with more that 20 0000 attendants. With over 200 satellite events spreading around Berlin made the entire city vibrant with technology, music, art, and science. This year’s conference topics covered a huge spectrum of everything that is bubbling at the moment; from design to blockchain, from food to future cities and health to AI, VR and IoT. The speakers, more than 200 of them, came from big companies and organisations like NASA, World Economic Forum, Google, Samsung NEXT, IBM, and Unity, as well as a wealth of small innovative companies in fields of tech, music, art, science or the intersection of all four. I visited TOA Berlin already for the second time. From this years conference offering I build my program mainly concentrating on speakers that coming from interesting up and coming companies in virtual reality, spiced up with a little bit of research, design and media. From the wide offering especially presentations from Adina Popescu, founder of Snowblack VR, Samuel Huber, CEO of Advir.co, Sonja Galunder, Senior Research Scientiest at Smart Information Flow Technologies (SIFT), Khalid Meniri, founder & CEO of Six Agency, and Ian Forrester, Senior Producer as BBC R&D gave a lot of food for thought. Putting yourself into the picture; explore how data can be visualised so that the user has control of it and can make an impact in it to make it more engaging and rewarding to the viewer. Variations matter in storytelling; use metadata to enrich the content and to get variation. Collect data; design VR so that you can collect data from it to learn about user behavior. Users want to do things but they want it do be done for them; give less choice but more engaging options. Apart form taking part in the conference program I also attended a satellite event at Fraunhofer HHI. Fraunhofer HHI – German equivalent to our Finnish VTT – is Europe’s largest application oriented research organization with a budget of more than 2,1 billion € and research highlights such as MP3 audio codec under their belt. Seeing their current research activities in the fields of VR, AR, MR, and IoT was enlightening. A visit to Berlin is always worthwhile. After all, it has for some time already been the tech capital of Europe. Lot’s of lessons learned and a lot of wow moments experienced. The world we work in is developing so fast you have to move fast to keep on track. Therefore it was also rewarding to see that here in Finland we at Stereoscape are definitively on the right track and moving at pretty much the same pace with the big players. Go Allport on new technology! World is a complex place. Every media is telling us that the world is changing and becoming faster and more dynamic. The change is mostly caused by the constant development of technology. If we take a quick look back in time, the first industrial revolution took place around late 18th century. It was about inventing the mechanical industry where steam power played a big role. The second revolution took place about 150 years later in the early 20th century when Henry Ford with his colleagues came up with the moving assembly line. The third industrial revolution started around 50 years later, which Alan Turing had lots to do with his research on computer science and artificial intelligence. Whether we are on the brink of the fourth revolution, or the third one is just prolonged, doesn’t really matter. The only thing that matters is that the speed of change is levelling and more and more variables come to play making the world ever more complex. One way to try to cope with the complexity is to use stereotypes. Gordon Allport is one of the most famous psychologists who understood how people perceive other people. According to him people have developed cognitive models – stereotypes – into their head to handle social situations faster and more efficiently. In fact, the field of social situations is so complex that people wouldn’t be able to reasonably interact with each other without a certain ready-made model. These models can also be called information categories. Several psychologists and social psychologists have continued to study the topic and expanded the theory to objects and entities as well. When people encounter something that doesn’t fit to any of their existing categories they either start forming a new one, shape the old one to accept the newcomer or leave it outside without getting to know it at all. Now that we are somewhere between industrial revolutions number 3 and 4, constantly witnessing new innovations and having non-stop noise from various channels, it might be hard to stay on top of everything – even impossible. That’s why categorizing things, using stereotypes, is a very recommended way to interpret the world. Below there are three “every-day” statements followed by a short explanation derived from social psychology describing what could be the reasoning behind the statements. Those can all present how existing stereotypes might affect people’s thoughts on new technology, such as augmented and virtual reality. What’s YOUR standpoint on these? People tend to justify their existing position towards everything else. In this case you might have categorized all new tech into one category and that might be even too simplified solution to understand the world these days. People tend to think similarly as their closest reference group. This way they can make a difference between them and another group they don’t (even want to) belong to. If the last statement is the one to best represent your thoughts and you want to hear more about the possibilities of new technology, such as AR and VR, we at Stereoscape are at your service. Give us a call! Heli Nelimarkka, chair of Stereoscape’s board, was one of the speakers of 3DExpo held in Finland in May. Below is a summary of her speech focusing on the clear benefits and competitive advantage that augmented, mixed and virtual reality bring for business. We already have massive amounts of IoT data. With artificial intelligence the data can be turned into knowledge. When this knowledge is – with the help of wearable technology like Daqri smart helmet or HoloLens – visualised and made available just at the right time and in the right place it opens up a whole new window of opportunity to companies. The hype around VR and AR has been going on for some time already. However, as Gartner Hype Cycle and other recent studies indicate, VR and AR are already well on their way of becoming business as usual for companies. The sectors expected to benefit most of this new technology are manufacturing industries, BIM, and healthcare. The ones of you still in doubt, I advice to take a look at a recent PwC survey showing that companies are more and more willing to invest in AR and VR in sales, marketing, training, maintenance, customer service, or development of new business models. A 3D animated digital replica of a product, created using existing CAD models, can be combined with product information and interactivity to allow several new ways of working. A product or a process can be simulated virtually even before it exists physically. A virtual showroom allows product presentations whenever wherever. With the help of collaborative VR teams can work together and be present in the same virtual space although physically located in various parts of the world. So-called digital twins – digital 3D product replicas incorporating real-time IoT data from the physical objects – offer even more exciting prospects. Examples of VR and AR in corporate use are already numerous and so are the benefits and competitive advantage they bring along. Companies like Boeing in USA or major car manufacturers in Germany are already taking full use of it. The benefits are counted in two-digit numbers. For example, at Boeing a team using AR with a tablet was 30% faster and reached 90% better quality accuracy than the team working with traditional means. And this is just the beginning. Alongside with direct cost savings and productivity improvements the benefits from e.g. faster learning, improved collaboration, and totally new business opportunities are waiting just around the corner. Recently at a virtual reality industry event I had the pleasure to invite people to test an augmented reality helmet. “Wow” is the word to best describe the feelings at our stand during the event. Wow, coming from the people testing the helmet. And wow, coming from me and my colleague demoing the helmet for six hours without a proper break in order to give as many visitors as possible from the constant queue outside our stand an opportunity to testdrive the device. What is this magical helmet and why does it create such a fuss even at an industry event packed with cool VR, AR, and MR demos? DAQRI SMART HELMET is a mixed reality hardware integrated with safety helmet and visor. The device differentiates itself from other HMDs (head mounted device) with the actual hard helmet that houses the mixed reality device. So it is a real helmet for people with a real need to protect their head in their duties. Duties, where safety is always an issue and where you work with your hands. So you wear a helmet and want to keep your hands free. Which is why DAQRI offers the protection and has a user interface that is operated with head movements or voice commands; to keep your hands free for the duties on site. DAQRI SMART HELMET brings mixed reality to any harsh working environment with rugged design and large potential in hardware and software solutions. The fact that the device is purpose-built for industrial environment shows in many ways. The device itself as well as the software are designed from ground up to perform in demanding environments like construction sites, factory floors etc. It also shows in the numerous extra features that the helmet has. DAQRI has mixed reality technology cameras for spatial awareness and holographic displays. Thermal vision, in turn, allows the user to capture infrared pictures and video. In an environment where heat is potential danger – to workers as well as to equipment – it certainly is an important feature. The remote expert –application in DAQRI allows new kind of communication between the worker on site and a remotely located colleague. Real time video communication through WiFi with helmet user and remotely located colleague allow information to be sent directly to helmet’s view. This way the worker on site with the helmet can get precise assistance to the task at hand. Stereoscape is the official partner of DAQRI in Finland. There is a lot of new things expected from DAQRI in 2017. So stay tuned to hear the latest, come and meet us at Arrow IoT Summit in Vantaa on 18.5. or just book a visit to our showroom to testdrive DAQRI yourself. A couple of weeks ago, Barcelona hosted the world’s largest gathering for the mobile industry, the Mobile World Congress (MWC) 2017. The huge event covers a wide scope of everything “mobile”. The telecom focus of this year’s event was the 5G technology and its implications to human life. The demonstrations and representations of these implications appear in various forms such as connected cities, connected cars, smart buildings using various media types, etc. Virtual reality was also highly visible at the event, as a vast majority of the big brands used VR applications in one way or the other. Some used it to demonstrate their product or services, while for others it was just a hook to catch the attention of the audience. QUALCOMM, for example, enabled visitors to embody their favorite Power Ranger character using a 360-animated video produced by Lions Gate. Ford introduced an auto-delivery experience using drones within their city of tomorrow concept. Mercedes-Benz was showing a virtual car configurator. Intel had 360 VR streaming and untethered wireless VR. Nokia offered a gamified tile-breaking demo showing comparison between 5G and 4G, while Samsung had multiple Gear VR stations involving various types of moving or rotating seats. HTC, one of the immersive VR device manufacturers, also had a large presence at MWC. While its competitor Oculus probably decided only to attend the Game Developers Conference, which was arranged at the same time, HTC had almost 10 Vive stations showcasing different products and features including the new tracker. Microsoft’s HoloLens was in frequent use in several demonstrations, though not so much as VR yet. But it definitely seems that mixed reality will be used more in the upcoming shows. For example, one of the attraction points at the event was Intel’s connected cars experience that features a BMW and a significant number of HoloLenses showcasing IoT, 5G and the city life. As Stereoscape, we visited this year’s MWC with a special interest, as we wanted to get personal feedback on a customer project. The project; visual presentations with 3D content, interactive video applications, AR demo and mobile applications for one of the biggest companies in the mobile industry was presented at the event for the first time. It was a rewarding and informative experience to observe how Stereoscape’s 3-month long project was used in the real context by the product owners. Stereoscape recently had the pleasure of working again with artist Josefina Nelimarkka on designing a custom VR experience for her latest exhibition at gallery Oksasenkatu 11. The piece, entitled Argos Telekinesis, exists parallel to Nelimarkka’s painting practice, connected not only by concept but also in their dual demands for time. The works are not simply made but require making, remaking and unmaking; the audience is encouraged to spend time, time to move and time to explore. In this way VR is the ideal medium to provoke a deep and prolonged engagement with art works. The visitors work their way through the installation, past interventions, past paintings exposed by starlight, descending the spiral staircase and eventually encountering the possibility of the Oculus Rift headset, to provide a portal into another world. The pacing of the exhibition allows for one to transition slowly from the physical world to the virtual. The goggles rest on a chair, inviting the viewers to sit comfortably and place them over their eyes, finding themselves within an infinite colour field, soft and drifting. The sky is laced with Greek letters, recalling constellations, both of the sky and of sentences. From here they can use their own eye movements to determine the direction they travel in, the words fly through space, revealing themselves to the reader. Their gaze decides what part of the narrative will be uncovered next, in this way the work is not just an immersive experience but a unique and individualised one, it will always be slightly different depending on the desires and decisions of the viewer. Even though there is also an external screen allowing others a glimpse into this world, they will not see the same journey as the lone traveller wearing the headset. Argos Telekinesis also functions as a kind of expanded book, using VR in this way introduces the possibility of a more immersive form of reading. Many visitors to the exhibition chose to stay in the virtual space for quite some time; it has already been acknowledged that VR is one way to potentially support positive sensations and consciousness. In the context of an artwork this provides a direct way to tap into and convey feeling in a style that is impactful, meaningful and long-lasting. The physical navigation of the audience recalls many of the themes present in the exhibition, in this way VR is a very versatile medium, able to adapt and run parallel to many of the major themes within contemporary art, such as presence, embodiment, memory etc. It’s inevitable that VR will develop even more of a role within contemporary art and here at Stereoscape we are excited to encourage this new frontier in the art world. The Virtual 2016 event was arranged in Espoo, Finland on May 26, gathering a number of companies and people engaged and interested in virtual and augmented reality. Together with the event arrangers, TNS Gallup Oy did a survey “Virtuality changes tomorrow’s business landscape – what Finnish decision-makers say?” Katja von Alfthan, Director, Innovation & Product Development at TNS Gallup presented the results and noted, “This event is the first connecting business and virtual technologies, at least in Finland. TNS discussed with stakeholders to gain more understanding of the issue, talking with companies utilising VR and AR, companies interested but not yet utilising the technologies, companies producing content and having a view on this ecosystem in Finland. TNS Gallup asked 100 business decision makers what their take is on virtual reality, how well they know the technologies, what kind of opportunities they see, and if there are some issues that still need to be solved before they can really do business with these technologies. Of these 100 decision makers, 19% said they know VR and AR technologies. “Recent studies made in the UK and US indicate that among consumers, some 23 to 25 per cent have never heard about VR or AR,” Katja von Alfthan told the audience. Of the 100 companies, some 25% are already utilising VR or AR – with a somewhat bigger percentage (some 35%) among larger companies. Approximately half of the respondents said they are interested in trying this out in their own businesses, with medium size companies, some 60%, showing most interest. However, when asked if the companies had made any specific plans on utilising VR or AR technologies quite many said no, some 60% of small companies, 70% of medium sized and 35% of big companies. “87% see that these technologies can provide them with competitive advantages, something new they have not seen yet,” von Alfthan noted. Quite many mentioned several fields where they could utilise these technologies. The most frequently quoted were customer experience and marketing, and education and training as well as communications. But there were also barriers identified in the results. 58% think that the technology is not ready enough. The decision makers are a bit uncertain of where we are going at the moment. They have a lot of questions starting from the very basics like what is AR and what is VR, and how can you use this really. How much money is there to gain? They also want to know what their consumers and clients think. Katja von Alfthan notes that this information is lacking, which is why TNS Gallup has launched a project to explore the consumer market in Finland next. When do the businesses think that they can really start utilising VR and AR technologies? Two out of three (67%) think it will take more than three to five years, even more, before they can increase the usage of these technologies in their businesses. There is a huge need for information on VR and AR. And more than 60% of the respondents did not know where they could find the necessary services or services that help them create the content for VR and AR. As the decision makers see they will only be able to utilise these technologies in 3 to 5 years, Ms. von Alfthan asks: How can the companies control the risks? They show plenty of interest, but there is a lot of information missing, so it is hard to see what there is to gain or lose with AR and VR technologies. Noting that most respondents think there is excellent know-how in Finland, but it is often hidden, Ms. von Alfthan thinks there is a need for a translator or interpreter between the know-how and the businesses, and adds that TNS Gallup could have a role in this task. She thinks value proposition is something companies should really pay attention to and that the one who gets to the market first gains the most. Markkinointi & Mainonta newspaper writes about the same topic. Click here to read the story in Finnish. Digitalisaatio on muotikaupassa paljon muutakin kuin verkkokauppaa. Digitalisaatio tuo parhaimmillaan myymälään lisää tietoa, lisää palvelua, lisää valikoimaa ja ennen kaikkea lisää elämyksiä. Steroscapen asiantuntijat kertovat uusimmassa Muotimaailma –lehdessä (3/2016) omia näkemyksiään siitä, mitä kaikkea digitalisaatio voi parhaimmillaan muotikaupalle mahdollistaa. Lehdessäkin mainittuja sekä muita keräämiämme esimerkkejä huikeista digitaalisista ratkaisuista muotikaupassa löytyy alla olevien linkkien takaa. Kaikki yllä olevat esimerkit todistavat vahvasti sitä, että digitalisaatiolla on paljon annettavaa myös muotikaupalle. Kaikki esimerkit ovat myös ulkomaisia. Mielenkiintoista onkin nähdä kuka luo ensimmäisen todellisen puheenaiheen ja digitaalisen wow-elämyksen Suomessa –me Stereoscapessa olemme mielellämme auttamassa siinä. “Information is cheap but meaning is expensive,” said George Dyson, science historian and futurist, a few years ago. In recent years, video has been the answer for creating more meaning in marketing. According to Forrester Research, video has been the fastest growing online ad format. In digital marketing, the benefits of video content over text are clear and undisputable. In fact, what could be a more compelling, effective, and entertaining way to make your company brand, or product known to your customers than a video? A video on your landing page keeps the visitors longer at your website and allows your brand message more time to sink in. Video is more memorable that written content. Websites with videos have reportedly double the conversion rates of websites with no videos. And to top it all, you can share your video content online not only on your own webpage, but in LinkedIn, Facebook, Vimeo, Youtube, Instagram, Twitter or any other channel you choose. You can take you online content and show it offline at tradeshows, customer meetings, big screens or small screen. The options are limitless and the costs are limited, if any, for sharing your content once it is created. But are you really creating more value to your customers or just creating more information with little meaning? And how can you measure the value you create? As the amount of video content explodes the harder it is to capture and engage your audience. In fact, some studies report that less than half of the viewers watch online videos all the way through and one third of the drop-offs stop watching your video already during the first 30 seconds. How can you tell how much of you message went though? Interactive video breaks the linear structure of traditional video by allowing the viewer to make choices to create a personalised experience. By allowing your viewers to interact with your video through touching or clicking, you allow them to take control over their experience, and by doing so, you create more value and more meaning to your audience. The viewers can watch content that is interesting and relevant to them; detailed data or technical information of your product for prospective buyers or a basic overview of the functionalities to the casual viewer. Or you can combine storytelling with e-commerce: Incorporate “shop now” buttons in your interactive video and drive revenue by converting viewers into shoppers. An example is an an interactive video on optimizing contact center performance, where the viewer’s choices affect what is told in the video. An other example, an interactive video with incorporated “shop now” buttons directed to consumers can be found, comes from the UK liftestyle brand Ted Baker. Choice creates interaction, interaction creates data, data creates insight and insight creates ROI. By providing choice within your video you can create a two-way communication that is more valuable to the viewer and to you. The choice you give your viewers leads to increased engagement. The more your viewers engage with your content the more data you collect as every click can be tracked. This way interactive video is going to give you much deeper insight into how you message is received, what your viewers are interested in and what not, or what their understanding of your product is. The data can also tell you weather or not you actually are effectively communicating with your audience. A recent study on interactive videos by Demand Metric Research Corporation in 500+ US companies shows that 66% of respondents reported more engagement, 44% longer viewing times, and 39% understanding audience behavior as the top benefits of interactive videos. The same study also shows that the greater the usage of interactive videos in a company was, the bigger the benefits experienced were; this in particular with benefits directly related to increased revenues and ROI. Metrics from the interactive video platform Wirewax show that 67% of the audience will interact, 3 times each. Engagement times are 3.5 times longer than for non-interactive videos, while shoppable videos show a 16%–48% click-through rate. Indeed it looks like interactive videos not only generate more engagement, but manage to turn that engagement into results. With interactivity you can deliver large amounts of information in a format that allows the viewers to make choices based on their preferences and interests. Add visualisation and good storytelling, and you can deliver your message in a compelling and immersive way that leaves a trace in the viewer’s mind. Interactive video doesn’t have to be all video; add 3D animations, slideshows, reports, data visualisations, or other interactive supplements to deliver your message and create meaning to you story. Take a look at GE World in Motion, for example. General Electric, a traditional industrial company transformed into a leading digital industrial company, is using visual content to deliver their message on digital platforms. The amount of information in “GE world in motion” is massive: 12 regions, eight themes and five different formats. If all of that information were to be delivered in a single – very long – video, would you watch all of that information in one go (let alone read all of it if it was all in one text document)? But with interactivity, the content is yours to play around with. It’s interesting and it is fun, and you find yourself clicking more and more of the hotspots on that GE globe just to see what’s in there. Or, if you are looking for some specific information, you just go straight to where you want. No time wasted on irrelevant information that is meaningless to your needs. One-way communication – the good old “sit back and watch” video – will for sure always exist, even online. However, interactivity is coming strong and it does have clear and measurable benefits over traditional video content. With interactivity, visualisation and good storytelling you can reach new heights in your digital communication. So why not give it a try? ”Nyt hanaa suomalaisyritykset” totesivat Osuuspankin edustajat ja Aalto-yliopiston tutkijat tuoreen suuryritystutkimuksen julkistamisessa ja kehottivat yrityksiä investoimaan rohkeasti kasvuun. Investoinnit digitalisoitumiseen näyttäisivätkin tutkimuksen mukaan olevan suuryrityksissä voimakkaassa kasvussa. Huolettavalta kuitenkin näyttää se, että suuryritysten panostukset markkinointiin puolestaan jatkavat tutkimuksen mukaan laskuaan. Vaikeina taloudellisina aikoina leikkaukset markkinointibudjettiin ovat usein näennäisen helppo säästökohde. Mutta jos yritys oikeasti – vaikeinakin aikoina – pitää fokuksensa tiukkana ja tavoittelee kasvua, ei asia enää olekaan niin yksinkertainen. Liika säästäminen syö kasvun mahdollisuuden. Markkinointiin pitäisi nimittäin myös uskaltaa panostaa. Paljon. Tai ainakin paljon enemmän kuin monet yritykset Suomessa nykyisin panostavat. Esimerkiksi kansainvälisissä konepajateollisuudessa markkinointi-investoinnit ovat noin 2-4 % liikevaihdosta. Suomalaiskonepajojen vastaava luku on usein jopa alle 0,5 % liikevaihdosta. Nämä luvut kertovat paljon ja ennen kaikkea siitä, että liian usein markkinointi nähdään vain kulueränä, josta säästetään aina kun voidaan. Markkinointi tulisi uskaltaa nähdä investointina. Investointina tulevaisuuteen ja ennen kaikkea kasvuun. Investointina, jonka pitäisi kiinnostaa koko johtoryhmää. Näin toteaa mm. markkinointivaikuttaja Anne Korkiakoski sekä valmistumassa oleva Viestintäalan tutkimussäätiön ja Sanoma Media Finlandin tutkimus ”Markkinointi-investointien vaikutus Suomen kasvuun ja kansainvälistymiseen”. Korkiakoski haastaa yrityksiä fokusoimaan tuotteisiin, hinnoitteluun ja voimavaroihin, joilla vallataan markkinaosuuksia. Tämä haaste pitäisi suomalaisyrityksissä ottaa vakavasti. Pieni haaste menee myös markkinointiväen suuntaan. Sen tulisi oppia nostamaan keskustelu markkinoinnin merkityksestä laajemmalle tasolle. Markkinointi on paljon muutakin kuin mediamainontaa ja kivoja kamppiksia. Se on tuotteistamista, kaupallistamista, myyntikanavia ja viestintää. Tämä on markkinointiväen osattava kertoa. Ja jos markkinointi halutaan nähdä investointina, tulee se pystyä perustelemaan samalla kielellä kuin muutkin investoinnit – analyysein ja numeroin. Oman lisänsä markkinoinnin haasteisiin tuo se, että myös BtoB-ostajan polku on voimakkaassa muutoksessa. Useat tutkimukset ovat todenneet, että samoin kuin kuluttajat, myös yritysostajat hankkivat yhä enenevässä määrin itsenäisesti tietoa päätöstensä tueksi. Siinä missä ennen laitettiin myyntireiska matkaan hyvä brosyyri mukanaan, täytyy tämän päivän BtoB-markkinoijan kyetä vastaamaan asiakkaidensa tiedonjanoon informatiivisella, kiinnostavalla ja helposti löydettävällä tiedolla. Digitaalinen visualisointi tuo markkinoitiin ulottuvuuden, joka ainakin insinöörivetoisessa Suomessa antaa usein etulyöntiaseman muihin markkinointi-investointeihin nähden. Kun visualisointiin uskalletaan panostaa ja tehdä siitä kolmiulotteista ja interaktiivista, saadaan entistä paremmin ostajaa puhuttelevaa sisältöä ja investoinnin tehoakin on usein helpompi mitata. Tietoa etsivän BtoB-asiakkaan aika on kuitenkin kortilla. Tietoa, jota yritys tuotteestaan ja palvelustaan tarjoaa ei asiakas kauaa silmäile, jollei se avaudu helposti, elämyksellisesti ja juuri hänen kysymyksiinsä ja kiinnostuksiinsa vastaten. Tarvitaan tarinaa, interaktiota ja elämyksellisyyttä. Virtuaalitodellisuus, 360-videot, interaktiiviset videot mahdollistavat asiakkaalle vapauden valita. Markkinoijalle ne antavat perinteistä videota enemmän asiakkaan katseluaikaa, lisäävät sitoutumista ja tuottavat tarkempaa analytiikkaa siitä mistä asiakas oikeasti on kiinnostunut. Nyt siis hanaa suomalaisyritykset – investoidaan digitaalisuuteen, markkinointiin ja loikataan digitaalisen markkinoinnin uuteen aaltoon – interaktiivisuuteen! By making the audience a collaborator they forget they are an audience at all, it is at this point that immersion is possible. The space is bathed in colour, time seems slower, the twinkling of stars somehow rendered audible. A site-specific installation, PRECESSION (screensaver) is Josefina Nelimarkka’s second solo exhibition. It is a technically ambitious work combining film, sound and an interactive constellation. Stereoscape are delighted to have been involved in both the conception and installation process, with our engineers devising the interactivity solution. Iona Roisin stopped by to see how it was all put together. The focal point of the exhibition space is a large angled screen, over which washes a continually shifting plane of colour and abstracted shapes. Revealed to be fragments of pigments, they have been magnified so as to make them visible on a molecular level – almost becoming astral surfaces themselves. Here the audience is invited to enter into the work, to navigate their way around a constellation of sensors, indicated in the space by soft spotlights, determining through their presence the sequence and length of the images on screen. Even if one chooses to avoid triggering the sensors, the drifting and hypnotic ‘screensaver’ will still play, allowing the audience to adopt both a passive and active position whilst still being immersed in the piece. There is movement, but the overall feeling is one of stillness, coaxing the participants into a process of collaboration, selection and reflection. There has long been an overlap between contemporary art and technology, in PRECESSION we see interactivity utilised in an innovative way that entices the audience and forges a memorable experience – and Stereoscape are proud to have been involved. Our engineers devised the best solution for Nelimarkka’s design, allowing the content to dictate the technical set-up. With site-specific works many of the details are finalised during the installation, particularly with interactive works the responsiveness of the sensors need to be tested in the space. Fine-tuning the sensitivity allows us to establish how close audience members need to get to be registered. A delay on the sensor picks up small movements so people of all heights can influence it. The participants can choose whether to stay still or move around, the footage will play for as long as the sensor is engaged and then continue if uninterrupted after the person leaves. This allows the participant to move around the constellation, to engage a different sensor or move closer to inspect the detail of the film – creating a physical montage. Stereoscape’s engineers programed the software to accommodate this looping and layering so that engaging with the work is possible alone or in a group. At the opening I was intrigued to watch people interact. Some are impatient, some move into the spotlight and wait for the work to sense their proximity and shift scenes. Mostly multiple people stand under the sensors, waiting to see what they have triggered. This aspect of exploration creates a feeling of discovery throughout the process. Much art hopes to influence participation and engage with its audience, and utilising an interactive solution is one way to achieve this. By inviting the audience inside, the thematic aspects of the work are accessible in a different way. There are parallels between what art and advertising hope to inspire in their audience, which make interactive solutions relevant to both promotion and contemporary art. Interactivity creates a space for close engagement between audience and situation. In inviting them to make decisions and engaging their spatial memory a more meaningful and memorable experience is generated. It can be employed on multiple levels, from physical to virtual – the key element is participation. By making the audience a collaborator they forget they are an audience at all, it is at this point that immersion is possible. Are you ready for all that digital is bringing to retail (including better profits)? The opening of the new Burberry store in London’s Regent Street in 2012 placed the British luxury brand on the forefront of the digital transformation of the retail space. Since then, a lot of other retailers have also started to integrate online and offline. A German bicycle store Rose Bike Town being one of them. In its new store in Münich, it allows customers to design and tune their dream bikes using the in-store iPads. The results can be seen in 3D on large touch screens in the store. And all this while a video wall at the back of the store is showing content that communicates the brand values. The TUI integrated concept store of the large European leisure travel group TUI Travel is another good example of integrating digital and physical sales channels. Large video screens on the storefront show high quality content to inspire and excite the customers (n.b. prices, offers or other uninspiring details are not shown on the screen). Inside the store, interactive maps and table sized touch screens are offered for searching the perfect holiday destination. At Tommy Hilfiger store in New York shoppers were provided with virtual reality headsets. With the headsets, the customers were given a three-dimensional, front-row view of the Hilfiger fall fashion show. For Christmas last year, Burberry launched a 3D campaign on the screens of Piccadilly Circus allowing the visitors to interact with their mobile phones with the famous curved screens. The results – personalised scarves beamed on the giant screens – could naturally also be purchased, online or from the store in Regent Street. All of the above are examples of the new engagement, entertainment, enrichment, and interaction that retailers are attempting to create with digital in-store strategy. Burberry, TUI and others are integrating online and offline for a seamless shopping experience; consistent and integrated no matter what the point of contact – digital or physical – is. And while some of the examples might be more testing and identifying new platforms of interaction and engagement, there is a lot to it in pure business as well. For example, the TUI concept store showed such a clear increase in sales as well as the average spend in the store that the company soon decided to roll out the same concept and technology to it’s other stores. TUI is not alone with better performance from the digital transformation of its retail space. A recent study made by the Boston Consulting Group showed that the digital leaders in retail are outperforming their peers that have not yet implemented a digital strategy. In the BCG survey, the 25 fashion retailers in Europe and North America with advanced digital strategies and implementing digital technologies in stores were showing a clearly stronger EBIT (earnings before interest and taxes) growth than companies not implementing a digital strategy. The opening of Burberry’s flagship store created a big buzz in the retail industry in 2012. What then seemed possible and available only for a large luxury brand is now available for everybody. The BCG study shows that even smaller investments can deliver good results. Affordable solutions are available for every size of business to use. In many of the examples of successful digital strategy, the solutions were made together with third-party developers – often innovative start-ups. With this kind of co-operation it is possible for even smaller retailers to launch an in-store digital strategy. In-store digital doesn’t necessarily need to mean in-house. In fact, today even the bigger companies often work together with start-ups to keep up with the latest technologies and innovations. Independent agents like we at Stereoscape have the possibility to speed up the development. Not bound to established ways of working, but instead quick to embrace new technologies, we have the possibility to work as technology accelerators for our clients. Because the truth is that a web page or Facebook or twitter account won’t count for a digital presence anymore. The new era of retail is already here; it’s technically possible, accessible, affordable, and it is good for your business. What are you waiting for? Vuosi 2016 tulee olemaan virtuaalitodellisuuden kannalta jännittävä. Muun muassa Oculus, Sony ja HTC tuovat vihdoin markkinoille kuluttajille suunnatut virtuaalitodellisuuslasit. Lasien kehitystä seuranneelle odotus on tuntunut välillä tuskallisen pitkälle, mutta vihdoin se on päättymässä. Odotus palkitaan kehittyneempinä kuluttajatuotteina, joilla pääsee nauttimaan parempaa VR-sisältöä. Erilaiset virtuaalitodellisuusdemot, joita tähän saakka on ollut saatavilla, ovat toki olleet erittäin mielenkiintoisia, mutta laitteiden yleistymiseen vaaditaan laadukkaampaa sisältöä. Virtuaalilasien julkaisujen viivästykset ovat antaneet lisäaikaa myös sisällönkehittäjille. Uudenlaisen sisällön tekeminen vaatii täysin uudenlaisia lähestymisiä esimerkiksi käyttäjäkokemuksen suunnitteluun, mikä vie aikaa. Nyt julkaistavat virtuaalilasit maksanevat joitain satoja euroja. Lisäksi tarvitaan tehokkaat tietokoneet sisältöjen esittämiseen. Vaikka uppouttavin VR-elämys syntyy tietokoneeseen kytkettävillä laseilla, suurin osa ihmisistä pääsee nauttimaan alkuvaiheen VR-kokemuksista edullisemmin katselemalla mobiililaitteita hyödyntäen 360-videoita ja sovellussisältöjä, kuten vaikkapa matkakohde-esittelyjä. Pienempi osa kuluttajista on valmiita maksamaan VR-elämyksistä useita satoja euroja, mutta pienemmän ja sitä innokkaamman ryhmän harrastuneisuus ja innostus ovat kantava voima myös VR-kehityksen takana. Vaikka virtuaalilasien kehitysaalto onkin nyt keskittynyt kuluttajatuotteisiin, on selvää, että yritykset voivat hyödyntää samoja teknologioita liiketoiminnassaan. Virtuaalitodellisuuden mittavat mahdollisuudet on helppo nähdä markkinoinnin ja myynnin lisäksi esimerkiksi koulutuksessa, suunnittelussa ja muissa yritysten sisäisissä prosesseissa. 360-videot ovat jo yritysten markkinointikäytössä. Mm. General Electric kertoo osaamisestaan vaikuttavasti VR-elämyksin – edistyksellinen markkinointiteknologia vahvistaa teknologiayhtiön yrityskuvaa. GE uskoo, että virtuaalitodellisuudella on mahdollisuus mullistaa markkinointi. VR:n tuottama läsnäolon tunne on vaikutuksiltaan dramaattinen sekä brändille että käyttäjille. Edullisemmat, kehittyneemmät ja helpommin käyttöön otettavat laitteet pienentävät myös yritysten kynnystä VR-potentiaalin hyödyntämiseen. On helpompi lähteä kokeilemaan pienemmin. Suurin arvo ensimmäisten kuluttajalaitteiden hyödyntämisessä saattaakin syntyä juuri yrityksille, jotka lähtevät nopeasti soveltamaan edullisempaa ja parempaa teknologiaa. Oma kiinnostukseni virtuaalitodellisuuteen on lähtenyt peleistä ja harrastajan innosta. Työssäni seuraan yritysten VR-projekteja. Olen vakuuttunut, että Suomen digiloikka jää vajaaksi ilman virtuaalitodellisuuden hyödyntämistä. Monet suomalaisyritykset ovat jo käyneet koeajamassa VR-ratkaisuja Stereoscapen näyttelytiloissa. Aito innostus ja kiinnostus virtuaalitodellisuuden tarjoamiin mahdollisuuksiin näkyy toivottavasti pian vaikuttavampina asiakaskokemuksina, parempina koulutustuloksina ja ajan ja kustannusten säästönä esim. suunnittelutyössä. Yli puolet tänä vuonna Slushiin osallistuneista startupeista uskoo hyödyntävänsä VR-tekniikkaa oman yrityksensä markkinoinnissa lähitulevaisuudessa. Virtuaalisuuden hyödyt ovat todellisia, ja uudet VR-lasit tuovat hyödyt kaikkien yritysten ulottuville. Teknologian ja insinööritaidon esittelyssä virtuaalitodellisuus on työkaluna vertaansa vailla. Ensi vuonna yhä useammat tuotteet, rakennukset ja prosessit heräävät eloon virtuaalimaailmassa – asiakkaiden ja myyjien iloksi. It’s not everyday you get the opportunity to strap into the Oculus Rift and be immediately transported to an art gallery, or a forest, or Mars – so naturally when offered I jumped at the chance. The first thing that struck me was just how quickly your brain accepts that you have moved into this hypothetical space and swiftly reorients itself. After starting out a little wobbly I was (virtually) walking into other rooms and picking up objects with relative ease, though to anyone watching from the outside I was probably a little less graceful than I assumed. In one demonstration you watch the floor drop out from underneath you to form a narrow bridge, which you are then asked to walk across and dared to step out into the void. After a short while this becomes so immersive that it’s difficult not to inch your way across the bridge, or hesitate when asked to step out, despite knowing perfectly well that the floor is still there. I cheated a little by gradually shuffling off the edge until my fears caught up with my rational mind and I realised I was safe. Aside from the obviously entertaining nature of all this, Stereoscape’s Virtual Reality solutions are primarily intended for industrial, training and retail purposes; catering in particular to engineers, architects and designers. Traditional Virtual Reality required you to be sitting whilst the action moved around you (think roller-coaster simulators), however the handheld control, which feels somewhat like a TV remote, frees both users and designers from these static constraints. Which means it is possible for designers to create multiple environments enabling users to decide themselves where to go, thus immediately creating a more memorable experience. Environments are created through processes like 3D scanning, 360 degree photography and digital designs with CAD files; so there is the potential to process existing material into new training situations, not only through complete immersion like the Oculus Rift but also across platforms by utilising touch-screen and hologram technology, depending on what is required. For example you are able to get right inside complex machinery and strip away the layers of things, like engines, in order to view the movements and regard the separate components of the equipment. Of course this works equally well for design and promotional purposes as well as for training. Apparently, it is through methods like this that many people who have been producing these parts get to see them operating for the first time. By working partially in a virtual environment there’s a heightened chance of trainees absorbing information more effectively and the opportunity to experience technologies in training that would never be possible in a physical situation. Likewise this training and promotion is possible before even manufacturing the parts. In our increasingly digital world this method of knowledge acquisition is much more in tune with how we learn and interact on a daily basis. It doesn’t rely on out-dated and dry forms that can be a challenge to focus on; even I can go into Virtual Reality and learn which screws to remove from the motor of a helicopter, which is of course fun but also prioritises communication by making knowledge and technology accessible and understandable on multiple levels. Stereoscape are bringing modern (if not futuristic) solutions to long established companies, and nurturing growth in new ones. Much of this technology is still in its infancy, but the swift innovations that are being made clearly indicate that the future of many industries lies in Virtual Reality, and indeed it’s becoming closer and closer to being a regular and consistent fixture in our own lives. It’s rare for effective educational tools and fun to converge into one point but it seems here this is happening, and who doesn’t want to believe in a little magic? The author is a British artist living in Helsinki. Myyntityylejä ja -tapoja on monenlaisia. On korkeapainemyyntiä, jota suorittaessa tukka vesikampauksella taakse vedettynä ja hiki pulisongeissa toitotetaan asiakkaalle oman tuotteen ja ratkaisun erinomaisuutta; on tarpeita luovaa myyntiä, jossa annetaan asiakkaan ymmärtää, että liiketoiminnan jatkuvuudessa on aukko ja se pitäisi paikata; on projektimyyntiä ja on asiakkuuden hoitoa ja on vaikka mitä. Sen enempää menemättä syvemmälle (ainakaan tällä kertaa) mihinkään näistä tyyleistä ja tavoista, on jokaisella myyjällä vain yksi tavoite – saada asiakas ymmärtämään. Myyjän täytyy saada asiakas ymmärtämään miksi juuri hänelle ja juuri nyt esitetty tuote tai ratkaisu on ostamisen väärti. Valuutan vaihdettua omistajaa on asiakkaalle jäätävä käteen rahalle vastinetta – sen tietää asiakas ja se täytyy myyjän pystyä todistamaan ennen kaupan lukkoon lyömistä. Ihmismieli tuppaa toimimaan siten, että se kaipaa seurauksille syyn. Syyn piirtäminen ihmisen mieleen visuaalisin keinoin vähentää riskiä joutua eri pallokentille heti puheen alussa. Keskitytään tässä nyt tästä eteenpäin vain B2B puolen suurempiin hankintoihin. Suuremmissa hankinnoissa on nykypäivänä usein ryhmä ihmisiä päättämässä hankinnan toteutuksesta. Päätöksiä tehdään ryhmässä pääasiassa siksi, että saadaan laajempi näkökulma päätöksentekoon mukaan, jotta kaikki mahdolliset asiat, joihin hankinta vaikuttaa (eli seuraukset), tulisivat huomioiduiksi. Tämän vuoksi seurauksia yhdellä syyllä (eli hankinnalla) on useita. Yksinkertaistettuja esimerkkejä: Talousjohtajan seuraus on hankinnan taloudelliset vaikutukset. Yritysvastuujohtajan seuraus on hankinnan eettisyys ja hiilijalanjälki. Loppukäyttäjän seuraus on hankinnan ominaisuudet ja varsinainen käyttö. Näille kaikille ja usein vielä monelle muulle pitää myyjän pystyä perustelemaan ratkaisunsa tarpeellisuus sekä ylivoimaisuus kilpailijoihin nähden. Oletetaan, että myyjän tarjoama ratkaisu todella on ainakin joltain ominaisuudeltaan parempi kuin kilpailijoiden vastaavat sekä ihan tarpeellinenkin. Näitä ylivertaisia ominaisuuksia kannattaa siis korostaa ja selittää asiakkaalle. Selittelyssä on se huono puoli, että se monesti jää – noh – selittelyn tasolle. Tästä syystä asiakkaan kuuloaistin hyödyntämisen lisäksi on järkevää esittää asioita myös nähtävissä olevassa muodossa, jotta asiakkaalle jäisi mahdollisimman vähän arvailuiden varaan. Asioiden ja esineiden visualisointi antaa myyjälle tarvittavaa vipuvartta, joka estää tehokkaasti väärien mielikuvien syntymistä sekä tutkitusti vahvistaa myös esityksestä jäävää muistijälkeä. Liian monta kertaa olen kuullut ihmisten jääneen ymmälleen heille esitetyn tuotteen tärkeydestä. Vastavuoroisesti myyjille tuntuu usein jäävän takaraivoon jyskyttämään, että miksei se osta kun tästä olisi käytännössä selkeää hyötyä tuonkin asiakkaan liiketoiminnalle – miksei se ymmärrä? Coop Italia has been exploring scenarios for future retail at its Supermarket of the Future created for Expo Milano 2015. The experimental project demonstrates how digital stories can make the physical shopping experience more informative, convenient and enjoyable. The future supermarket is a fully functional store with products exhibited on large interactive tables. A wave of the hand over the desired product is enough to activate digital mirror displays to show information about the product’s origin, ingredients, nutritional data, possible allergens, carbon footprint and even related recipes. Over 80% of consumers rank ingredient transparency among top purchase drivers for food, beauty and household products. Yet, only 57% regularly check the list of ingredients before purchasing. Making it easier to get relevant product info provides genuine value added to consumers. The innovative digital “product labels” in Coop’s future supermarket offer transparency and traceability in a highly engaging way and add an element of discovery in the shopping experience. Solutions for informative digital stories and interactions with real-world products are already commercially available. Stereoscape’s iScape – an interactive shelf based on RFID technology – enables physical products to trigger product information and other digital content on a mirror display or another digital screen. Consumers have learnt to expect rich, in-depth product content when browsing and shopping online. iScape brings that content into the physical store, augmenting the real-world experience. Every product has a story to tell, and interactive digital touchpoints in physical retail give you exciting new opportunities to tell those stories to your customers. Vähittäiskaupan murros sekä kivijalkakaupan monikanavaistuminen ovat olleet keskeisiä puheenaiheita viimeisen parin vuoden aikana. Paljon on puhuttu siitä, häviääkö kivijalka ja asiakkaat siirtyvät tekemään ostoksensa verkkoon halvemman hinnan perässä. Verkkokauppa on nähty uhkana kivijalalle kun todellisuudessa se on kivijalkaa tukeva toiminto, joka tarjoaa mahdollisuuden rakentaa asiakkaita palvelevan monikanavaisen kokemuksen. Kivijalka ei ole kuitenkaan häviämässä minnekään. Ihmiset edelleenkin haluavat kosketella, tuntea ja olla läsnä oikeassa kauppaympäristössä muiden ihmisten ympäröimänä. Tämä ei kuitenkaan tarkoita sitä, että kivijalka säilyisi ennallaan ja samanlaisena kuin tänä päivänä. Päinvastoin, tulevaisuudessa kivijalka on yhdistelmä kokemuksia ja teknologiaa, jossa fyysinen ja digitaalinen maailma yhdistyvät toisiinsa. MIKSI NYT ON AIKA HERÄTÄ KIVIJALKAKAUPAN MURROKSEEN? Showrooming: Kuluttaja käy katsomassa ja tutkimassa tuotetta kivijalassa, mutta menee kotiin ja ostaa tuotteen verkkokaupasta. Näin käy siksi, että monet kuluttajat haluavat edelleen nähdä, koskea ja kokeilla tuotetta, mutta menevät halvemman hinnan perässä verkkoon. Webrooming: Kuluttaja etsii tuotetta verkosta, mutta ostaa varsinaisen tuotteen kivijalasta. Kuluttaja siis vertailee tuotetta ensin verkossa, mutta haluaa kuitenkin olla varma päätöksestään ja marssii kivijalkaan näkemään ja kokemaan tuotteen. Elämysten luominen: Kuluttajat janoavat kokemuksia. Kivijalan etu verkkoon on, että kuluttajat voivat tuntea, nähdä, haistaa, koskea ja kokea erilaisia elämyksiä. Kivijaloista on tullut kuin näyttämöitä, joiden on pystyttävä luomaan kuluttajille odottamattomia sekä mieleenpainuvia kokemuksia, jotka saavat kuluttajat palaamaan yhä uudelleen ja uudelleen. Diginatiivien nousukausi: Vähittäiskaupan on sopeuduttava kuluttajien muuttuneeseen ostoskäyttäytymiseen. Nuoret ovat tottuneita mobiilikäyttäjiä ja heille kännykkä on tärkeä ostosväline. Erityisesti he etsivät tarjouksia, tuotearvosteluita, tuotteen saatavuutta sekä vertailevat hintoja. Täten mobiililaite toimii ostosta tukevana välineenä. Pohjoismaissa tehdyn tutkimuksen tulokset näyttävät, että Suomessa vain 15% vähittäiskaupan alalla toimivista on integroinut mobiilin osaksi asiakaskokemustaan. Muutos on siis varmaa. Kivijalka säilyy keskiössä, mutta kivijalan tulee ottaa digitalisaatio kiinteäksi osaksi toimintaa, jotta on mahdollista luoda monikanavaisia, nykyajan kuluttajien tarpeita vastaavia asiakaskokemuksia. Keskeistä on, että kuluttajille on pystyttävä luomaan unohtumattomia asiakaskokemuksia, kanavasta riippumatta. WorldViz is the industry leader in turnkey interactive visualisation and simulation solutions and provides world leading Virtual Reality expertise and unparalleled immersive visualisation experiences. Stereoscape is part of the WorldViz reseller network and we had the pleasure of talking with Sandra Bergmeir, Solutions Architect from Worldviz about the future of Virtual Reality (VR). How do you see Virtual Reality can be used in business sector? This depends highly on the type of business. But basically anything that can be supported or improved by a visual representation or simulation can benefit from VR. Product development and design reviews, maintenance and safety training, customer presentations, sales events and so on and so forth. What kind of use cases do you have in business sector? I think I mentioned the general ones above. Training I believe is one of the biggest parts. Also, a lot of construction and architecture as well as hospital design. How much Virtual Reality is used at the moment in business sector? The business sector is slowly starting to pick up on it. So far companies often don’t realize the business value of VR. That’s where we have to come in and help them understand. What are the best ways to utilise Virtual Reality in companies? I think the huge advantage of VR over all other types of visualisation is the immersion and full-scale models. Using VR in the design and development process can greatly improve and therefore shorten processes. It can help teams consisting of different people (like designers, engineers, executives and other stakeholders) can now communicate on the same level. This will save time and money! What kind of cases are the most common for you in general? We still are mainly working in the academic sector mainly psychology, vision science and neuroscience. These sectors have been using VR for a long time now. They’ve helped improve the technology tremendously which the enterprise can profit from greatly. How do you see the future will be for Virtual Reality and how it will be used? I think VR can potentially improve many parts of our lives. I believe that mainly businesses will use VR in the future and potentially the entertainment sector. The next 5 years will hold great technological jumps and I’m excited to see what’s to come. What Virtual Reality enables that other interactive solutions don’t provide? The sense of presence and the ability to physically experience a computer generated environment in a fairly natural way is VRs great advantage. It’s different to watch a movie or interact with a 2d or even 3d screen compared to actually being somewhere else. Nykyisessä hektisessä maailmassa visuaalisen viestinnän merkitys korostuu jatkuvasti. Jaksamme paneutua yhteen asiaan todella lyhyen aikaa kerralla, joten markkinoijan on onnistuttava kertomaan tuotteensa tarina nopeasti ja muistettavalla tavalla. Suomalaista digitalisaatiokeskustelua leimaa keskittyminen verkossa tapahtuviin asioihin ja some-konsultit julistavat perinteisen myynnin kuolemaa. Markkinoinnin automaatiosta odotetaan messiasta, joka vapauttaa suomalaisen insinöörikansan myynnin pahasta ikeestä. Allekirjoitan sen tosiasian, että uudet teknologiat muuttavat (ja toivottavasti myös tehostavat) myynnin tekemistä. Uskallan kuitenkin olla eri mieltä siitä, että perinteinen myynti olisi kuolemassa. Myynti on ihmisten kohtaamista, jonka merkitys korostuu, kun kyseessä on yhtään matkapuhelinta monimutkaisempi kokonaisuus. Näissä ”oikeissa” kohtaamisissa tullaan tulevaisuudessakin ratkaisemaan suomalaisten yritysten menestyminen. Digitalisaatio tuo aivan uudenlaisia, interaktiivisia keinoja tarinan kerrontaan asiakaskohtaamisissa. Näistä keinoista kaikkein interaktiivisin on virtuaalitodellisuus, jossa passiivinen näkijä muuttuu aktiiviseksi kokijaksi. Alla muutamia näkemyksiä ja ajatuksia virtuaalitodellisuuteen. Virtuaalitodellisuus rinnastetaan usein päähän puettaviin näyttölaitteisiin. Keskustelu mediassa keskittyy uusien laitteiden kehittymiseen ja julkistuksiin. Laitteistot kehittyvät huimaa vauhtia ja nyt jo on mahdollista niin kutsuttujen haptisten laitteiden avulla lisätä elämykseen tuntoaisti. Todellisuudessa arvo markkinoijalle perustuu sisällön laatuun. Virtuaalitodellisuuden on sanottu voimaannuttavan sisällön ja antavan kokijalle vallan. Sisältöä suunniteltaessa on varmistuttava siitä, että palvelun tai tuotteen lisäarvo saadaan esille optimaalisella tavalla. Jo mainittu laitteiden kehitys on johtanut siihen, että laitteistojen hinnat ovat muutamassa vuodessa pudonneet murto-osaan entisestä. Ohjelmistojen ja alustojen kehittyminen on myös ollut huimaa. Vielä hetki sitten virtuaalitodellisuusratkaisut tehtiin pelien tekemiseen suunniteltujen alustojen päälle, mikä teki sovellusten tekemisestä työlästä, koska näitä alustoja ei yksinkertaisesti ole suunniteltu siihen. Nykyään käytössämme on alustoja, jotka on suunniteltu nimenomaan virtuaalitodellisuuksien rakentamiseen. Kolmas yleistymiseen vaikuttava tekijä on ymmärryksen lisääntyminen ja soveltamisen oppiminen. Nyt ollaan jo pidemmällä kuin muutama vuosi sitten, mutta väitän, että olemme ymmärtäneet vasta murto-osan mahdollisuuksista. Kuten mainittu jo aikaisemmin mahdollistaa virtuaalitodellisuus markkinoijalle erittäin interaktiivisen tarinan kerronnan. Olemme jokainen nähneet loputtoman määrän erilaisia palvelukuvauksia tai teknisiä piirustuksia. Mitä jos kohderyhmäsi voisikin kokea palvelusi tai tutkia tuotettasi todellisen tuntuisessa ympäristössä jo ennen hankintaa? Kasvattaisiko lisääntynyt elämyksellisyys myyntiäsi tai olisiko innovatiivinen mielikuva pahaksi brändillesi? Perinteisen markkinoinnin termein suurin etu virtuaalitodellisuudesta markkinoijalle on muistettavuuden parantuminen ja erottautuminen asiakaskohtaamisissa. Virtuaalitodellisuuden on ennustettu yleistyvän huomattavasti vuonna 2016. Itse olen tästä innoissani ja niin tulisi olla jokaisen markkinoijankin, sillä teknologia antaa oivan keinon lisätä elämyksiä ja vakuuttaa kohderyhmä. Kun mikä tahansa yritys kehittää hienon ja kilpailukykyisen tuotteen, mietitään samaan aikaan, miten tuo mainio tuote markkinoidaan ja myydään ja miten siinä hyödynnetään visualisointia. Varsin usein turvaudutaan esitenippuihin, joihin painetaan laadukkaita valokuvia. Entistä enemmän visualisoinnissa käytetään liikkuvaa kuvaa, videona tai animaationa, joka havainnollistaa ja opastaa tuotteen erinomaisuuteen niin omaa henkilöstöä kuin asiakkaita. Käsikirjoituksessa pohditaan, mitä tuotteen ominaisuuksia ja hyötyjä halutaan korostaa ja miten monikäyttöisesti videota voidaan hyödyntää koko tuotteen elinkaaren ajan. Yhä useammin fokuksessa on tuotteen tarina. Sosiaalisina olentoina meidät on ohjelmoitu muistamaan paremmin tarinoita kuin kuivaa dataa ja numeroita, ja tarinankerronta tehoaa myös tuotemarkkinoinnissa. Mutta tärkeistä ominaisuuksista ja kilpailjoista erottavista yksityiskohdista pitäisi myös kertoa kiehtovasti. Miten yhdistää tarinat ja kovat faktat? Tämä onnistuu, kun visualisointiin liitetään vuorovaikutus. Vuorovaikutteinen visualisointi ja interaktiiviset tuoteanimaatiot mahdollistavat monipuoliset tuote-esittelyt, joissa tuotteen tarina ja tuotetieto yhdistyvät kiinnostavasti ja elämyksellisesti. Powerpoint-esitysten sijaan rikastetaan asiakastapaamisia vuorovaikutteisella visualisoinnilla, jonka avulla läpivalaistaan tuote yksityiskohtia myöten: tutkitaan pyörittämällä kolmiulotteista tuotetta eri vinkkeleistä, zoomataan niihin yksityiskohtiin, jotka kiinnostavat, räjäytetään tuote osikseen ja sukelletaan tuotteen tai prosessin sisään. Kerrontaa voi jatkaa infotekstien kautta, jolloin kuvien takaa löytyvät välittömästi asiatiedot, numeroarvot, käyttöohjeet ja esitteet. Tutkimukset todistavat, että vuorovaikutteinen visualisointi herättää huomion ja lisää elämyksellisyyttä. Vuorovaikutteinen visualisointi kiinnostaa, on mieleenpainuvaa ja uskottavaa sekä antaa asiakkaille positiivisen kuvan yrityksen tavasta toimia. Substanssiosaaminen välittyy asiakkaalle osana tuotteen tarinaa. Myyntipuskun tilalle syntyy vuoropuhelua, jolla autetaan asiakasta ymmärtämään päätöksentekoon vaikuttavat yksityiskohdat. Monimutkainen muuttuu selkeäksi. Ja kun tuotteita ei vaikkapa kokonsa takia voi kuljettaa mukana, on virtuaalisesta tuote-esittelystä saatava irti kaikki mahdollinen. Asiakkaan aika on laatuaikaa myyjälle. Kaiken takana on tietysti digitalisaatio. Uudet digitaaliset työkalut mahdollistavat uudet tavat toimia. Suomi kaipaa digitaalista hyppyä, ja tämä loikka olisi nyt markkinoinnissa ja myynnissä tarjolla vuorovaikutuksella vahvistetun visualisoinnin avulla.